To boost productivity in the future, Asian governments will have to implement well-targeted structural reforms today. Asia has been the world champion of economic growth for decades, and this year will be no exception. According to the latest International Monetary Fund Regional Economic Outlook(REO), the Asia-Pacific region’s GDP is projected to increase by 5.5% in 2017 and 5.4% in 2018. Despite escalating geopolitical tensions, most countries in the region have maintained their economic momentum. They have benefited from policies supporting strong domestic demand in China and Japan, and from favorable global conditions. Growth is picking up across many advanced and emerging market economies, and financial markets have, for the most part, proven to be resilient. Nonetheless, Asia will still have to confront fundamental medium- and long-term challenges, not least the aging of its population – a problem that is well known to most policymakers. In past decades, the region reaped a demographic dividend from its young, expanding workforce and strong growth policies. But this dividend has already run out for “old” countries such as Japan and China. With fertility rates declining and people living longer, the workforce is shrinking and getting older at the same time. 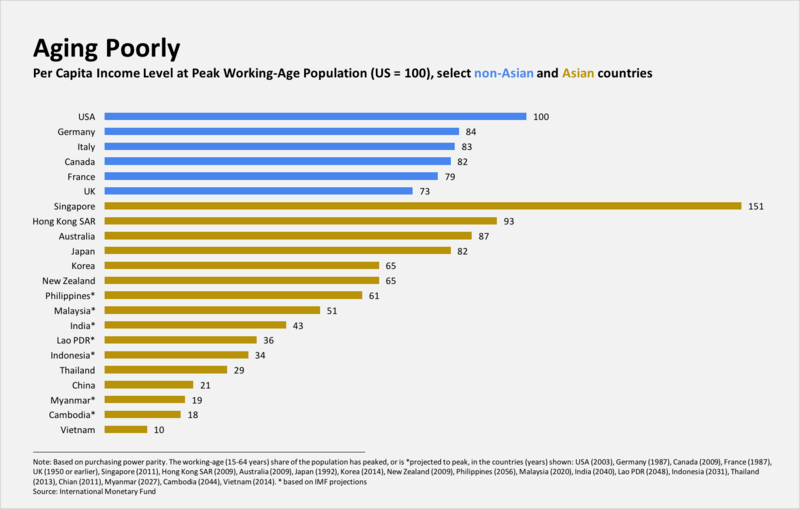 To be sure, not all Asian countries are aging at the same rate. In China, Japan, Korea, and Thailand, these demographic trends could subtract anywhere from 0.5 to a full percentage point from annual growth over the next three decades. But in “young” countries such as India, Indonesia, and the Philippines, the working-age population will actually increase, adding from 1-1.5 percentage points to average annual growth over the same period. And yet, even these young countries will not be spared from the effects of an aging population. In this year’s Asia-Pacific REO, we point out a little known fact: almost all of Asia is at risk of growing old before ever becoming rich. Why is this occurring? For starters, although Asia is not the most aged region in the world today, it is aging remarkably fast. One indicator of this is the old-age dependency ratio: the share of the population that is 65 and older. In Europe, it took 26 years, on average, for this ratio to increase from 15% to 20%; in the United States, it took more than 50 years. Among Asian countries, only Australia and New Zealand aged at similar speeds. In most other countries in the region, this transition took – or will take – less than 15 years. So, being the world growth champion simply isn’t enough. To see why, consider each country’s per capita income (in terms of purchasing power parity) when its old-age dependency ratio, benchmarked against the US experience, peaked or will peak. As the chart above shows, with the exception of already-rich Asian economies such as Australia, Hong Kong, Japan, and Singapore, per capita income in Asian economies falls, or will fall, far short of other advanced economies at similar stages of the aging cycle. For example, when China reached its old-age-population peak in 2011, its per capita income was still only at 20% of the US level; and when Vietnam reached it in 2014, that figure was just 10%. And despite its young population and strong growth, India’s per capita income will only have reached 45% of the US level when its old-age population peaks in or around 2040; and that assumes, optimistically, that India will maintain very strong growth over the next few decades. This demographic trend has far-reaching implications for the region. Asian countries will have significantly less time than advanced economies have had to prepare for the transition to an aged society. Worse, they will have to manage the high fiscal costs of aging while they are still relatively poor, which will create new social pressures, which are already apparent in the “old” Asian countries. Moreover, slowing productivity growth could compound Asia’s demographic problem. Since the 2008 financial crisis, productivity growth has decelerated in Asia’s advanced economies and, to a lesser extent, in its emerging economies, too. Thus, the region’s push to catch up with countries at the global technology frontier has stalled over the past decade.